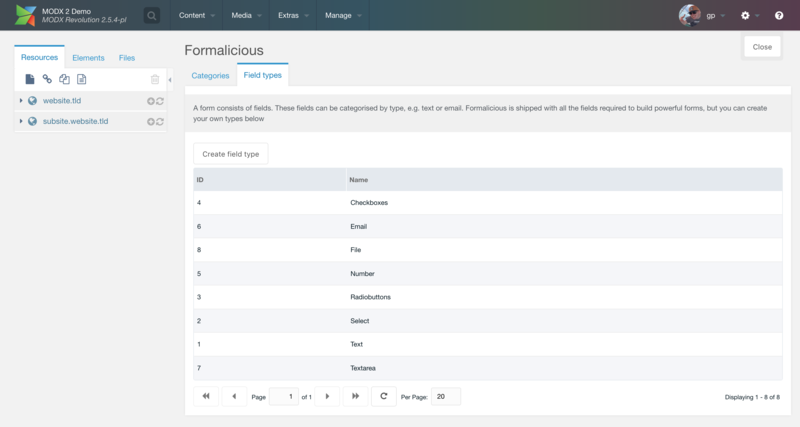 Formalicious is the most powerful and easiest MODX form builder, with built-in multi-step forms, 8 field types, hooks, validation and the ability to use advanced FormIt features. Formalicious is a powerful multi-step form builder, with support for 8 different field types, built-in validation, and the ability to use hooks and other advanced FormIt features. 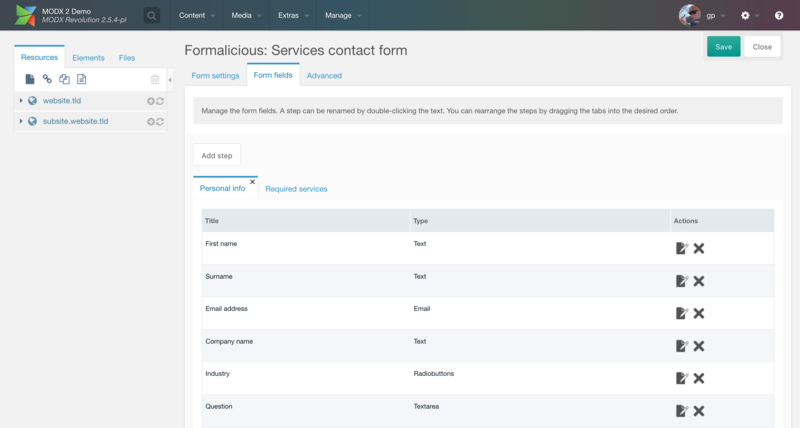 Formalicious speeds up your own form-building and also enables your clients to manage their own forms with just a few clicks. Powered by Sterc. 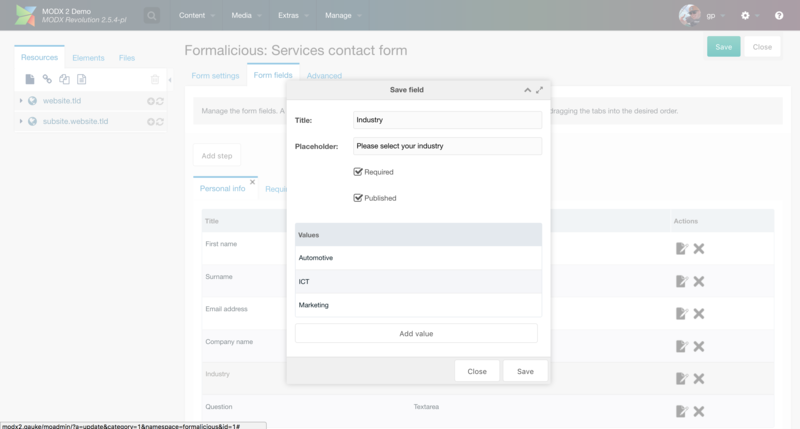 With all necessary fields types, you can intuitively build forms for anything from contact forms to event registrations. You can choose from the following: text, textarea, email, number, checkboxes, radiobuttons, select, and file upload. 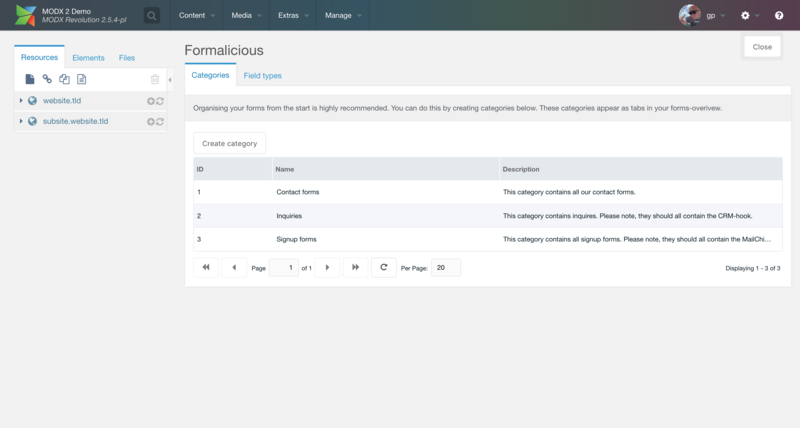 Create forms that span multiple pages, without having to worry about setting up temporary storage, resources for each step, or other headache-inducing steps. 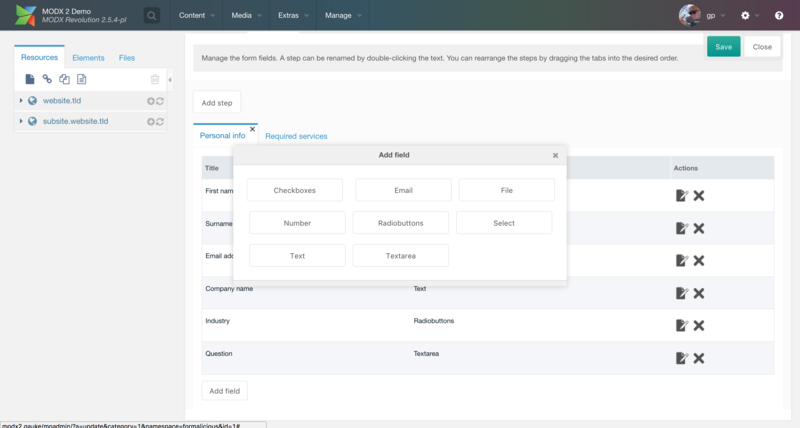 Just click Create new step and add the fields, Formalicious takes care of the rest. Just tick the box to mark a field as required, and Formalicious automatically handles validation for you. Submitted values are also automatically sanitised to make sure your form is protected against Cross Site Scripting (XSS) attacks. If you need to use one of the more advanced features of FormIt, such as pre- and post-hooks, or want to specify additional properties, you can add those to your forms through the Formalicious component as well. 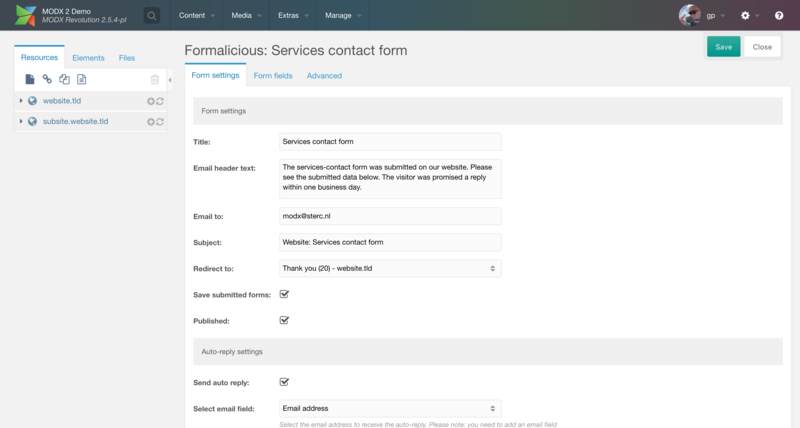 Every form submission is automatically sent to a designated email address and a friendly auto-reply is sent to the website visitor when submitting a form. All emails are 100% customisable with your own corporate identity. Saving forms can be useful as a backup, but it's also a privacy risk. Therefore FormIt has been equipped with Rijndael 256-bit encryption to keep your data secure (mcrypt module required). 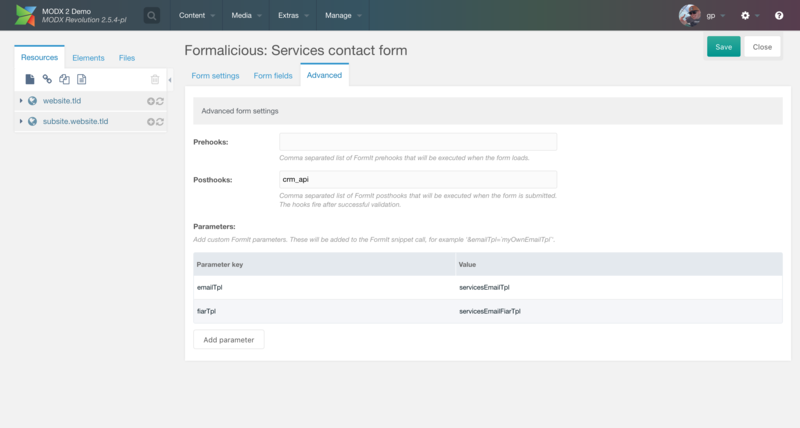 Formalicious has tons of possibilities by default, but it also comes with the ability to customise it to your own needs. Add you own custom validators, field types and emails. 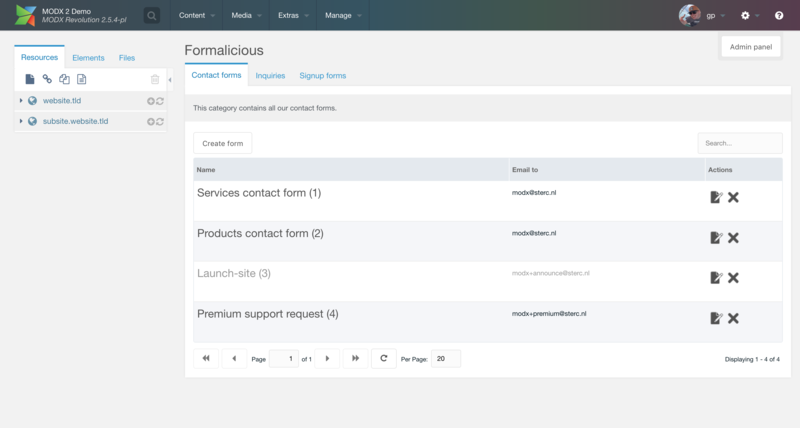 Formalicious speeds up your own form-building and makes it easy for clients to create and manage forms.